I found this in a recent post on the Adventures in Agentland blog. A plot dot test is supposed to be a way of determining where in your plot action is lagging. To start, you either need a finished manuscript or detailed outline. It goes like this: Take a sheet of paper, and all along the top write a line of numbers corresponding with the number of chapters in your story. For each chapter, place a dot somewhere below that number. The idea is to make a bar graph for your story, with the x axis being your story chapters and the y axis being the amount of action in a given chapter. There were a few errors when graphing, hence the crossed-out dots. Other than that, that’s how I feel the plot flows. Judging by this graph there are areas where I could probably ramp up the action. It does look rather slow, but looking at the outline itself I would disagree. It’s an interesting test but I feel there is a wide margin of error to take into account as we’re measuring something that can’t really be quantified. Yeah, a useful tool for a writer, but not really an acid test for a problem. 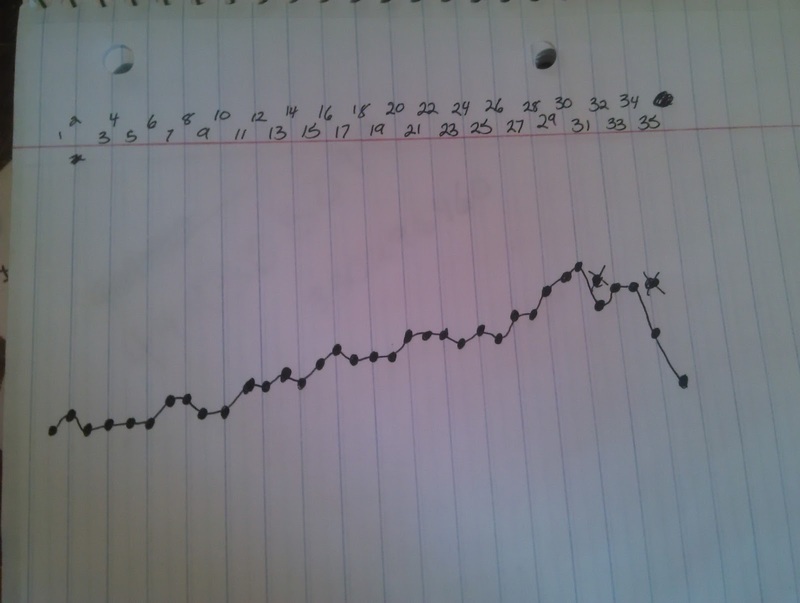 I did something similar at Odyssey, where I was charting my emotional engagement in a story throughout. More than anything I think it's useful as a way for the writer to compare his intentions versus readers experience. If there's a drop at a particular point, it might be a problem if the writer wants to keep things building, or okay if he wants to back off a little and let the reader catch his/her breath.